Our Tree Tent is similar to a Harvest Mouse nest. It was designed by local inventor Jason Thawley, and was the first to go up in England. It featured in George Clarkes Amazing Spaces. It will comfortably sleep 2 adults and 1 child. It has its own fire pit and a grass area for you to relax on and enjoy the sunshine and Sussex wildlife here at The Secret Campsite. 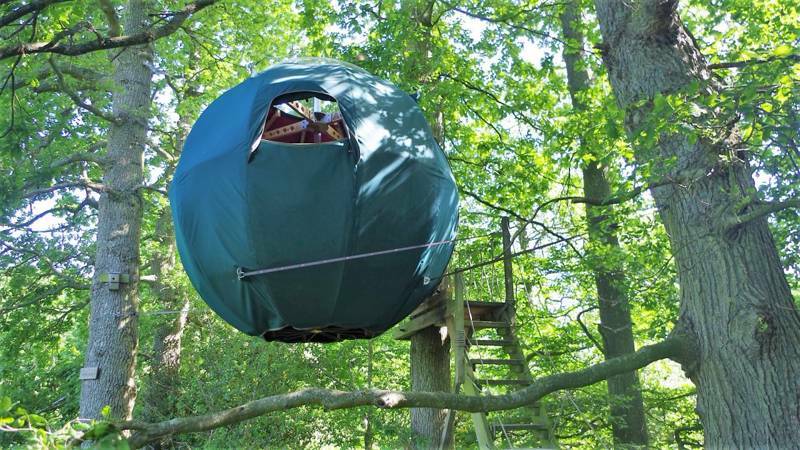 Access to the Tree Tent is via wooden stairs, From the two windows in the Tree Tent there are fantastic views across the campsite and on to the South Downs National Park. We provide 3 single beds with mattresses (but no sheets or pillows). There are free hot showers and toilets at the campsite. If you are more than 3 people, there is space beneath the tree tent on the grass pitch to put up your own tent.